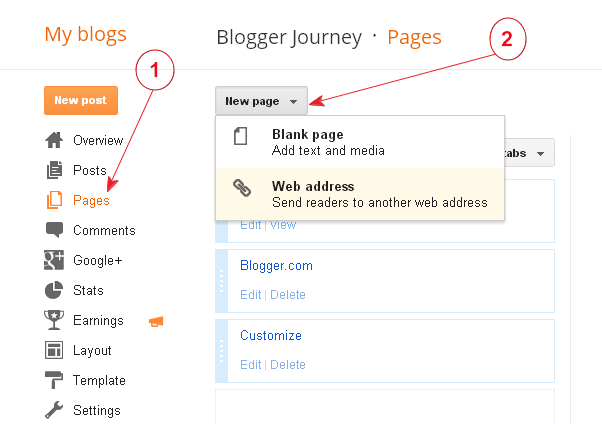 Blogspot (blogger.com) supports static Page, along with regular Post. That's what many bloggers know. But do you know, the Page feature actually provides 2 type of Page, one is regular Page, another is (can be called) Forwarding Page. Regular page is a stand-alone page that separates from your default home page. Each time after you publish a post, it always goes to your home page and showing at the top, which will not affect other stand-alone pages. For example, you can create an About This Blog page that discusses the evolution of your blog, or a Contact Me page that provides introductions about yourself. I call the 2nd type of page as Forwarding Page, because it's not a actual static page like the regular page, it's just a page name that forwards to another webpage address (URL). For example, take a look at my following tab bar, the tab "Customize" is not an actual page, it forwards to the web address (URL) for one of my labels "Customize". 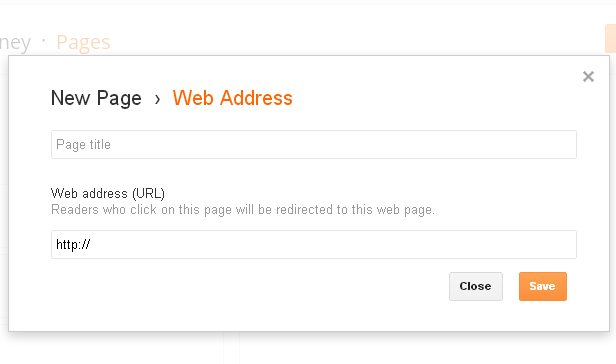 When using this Forwarding Page, you can forward it to any other web addresses you want, it can be a individual post, or a label (category), or another website. Type in your Page name and forwarding web address, click on Save, you done ! 3. How can web visitors access your pages ? How do you like the page feature? How do you use the page feature? What's the pros and cons for the Page? Share your experience and insights in the comments box below. Hi. This may be a stupid question but I am new to blogger and I would like to know how to create like 'pages' within a 'page'. For example I have create a page called 'Countries' and I would like to have like a drop down menu that shows the different countries under that 'Countries' page. Is that even possible? Thanks..
great information thank you for the help! Can I create a page(regular page) and have post sent to it without using the forwarding page? this helped so much...thank you! You are absolutely brilliant!! This was exactly what I was looking for. Thank you so much for all of your help!